In the past several months, I have been reading up on food additives and government regulations regarding food labeling. While that has been a very educational process, it has also opened my eyes to a lot of things I wish I didn’t know about what goes into consumer packaged goods and the sly ways in which food manufacturers list their ingredients so you wouldn’t know that, for example, “natural flavoring” isn’t all that “natural.” I’ve been trying to keep my concern from reaching the point of paranoia, but it’s getting more and more difficult the more I know. For example, that immaculately white powder I used to put in my coffee is, as it turns out, not as innocent as it looks. Its liquid counterpart is just as bad. First ingredient on the list is corn syrup solids, closely followed by partially hydrogenated soybean oil (trans fat). Then there are Mono- and Diglycerides as stabilizers, Sodium Aluminosilicate as an anti-caking agent (the same substance used to make fertilizer and dishwasher detergent and to remove ink from waste paper), artificial flavor, and sometimes Silicon Dioxide (an anti-caking, anti-foaming agent). And these days, one could only pray that the milk derivatives used to make these powders aren’t shipped directly from the country/countries where Melamine and food merrily mingle. Black coffee is not an option for me. But none of the other alternatives is good enough. Nonfat milk powder tastes crappy. Regular milk dilutes my coffee and turns it frigid and ugly. Half and half or cream is okay, but I don’t really dig the taste or the fatty film it leaves on my tongue. Soy milk makes my coffee taste funny. I have recently switched to evaporated milk which I thought tasted great. Sadly, it is still far from being additive-free. Dipotassium Phosphate and partially hydrogenated soybean oil are routinely added to it. To date, I have not found organic, garbage-free evaporated milk. If such a thing exists, it is not readily available where I am. Then I got to thinking. If Carnation can make evaporated milk, so can I. I mean, how hard would it be to make evaporated milk? All you have to do is, well, evaporate it, right? The goal is to reduce the milk by 60% in order to produce a very creamy and concentrated result. I decided to experiment with half a gallon of organic milk. Forty percent of a half gallon translates roughly to three cups or 24 fluid ounces. At the beginning, I poured only three cups of milk into the pot which I planned to use. That gave me an idea of how high up from the bottom of the pot three cups of liquid would be. Having mentally made a mark on the side of the pot, I poured in the remaining milk and started the process. Now a word about the pot: you should use a heavy-bottomed pot – a pot whose bottom is as nonstick as possible – preferably a wide one (the larger the surface area, the shorter the evaporation process). Stir quite frequently with either a wooden spoon (very good) or a heat-resistant rubber spatula (even better). You want to stir frequently and scrape off any sticky bits at the bottom of the pot as you go. Once the milk comes to a boil, reduce the heat down to very low. At this point, the milk no longer needs to be stirred constantly. Still, you should give it a stir and scrape the pot bottom every 7-8 minutes or so. The other issue comes from the “skin” which the hot milk forms on top no matter how low the heat is. It’s unavoidable. The skin needs to be fished out and discarded or at least stirred back into the milk from time to time. It won’t melt into the milk, but if you don’t do anything to it, the skin will act as a protective layer that keeps the moisture from evaporating through the surface. At this point, don’t worry about the milk “skin” or the brown bits you’ve scraped off the bottom. Everything will get strained out later on. Your biggest concern at this juncture is to make sure the milk doesn’t burn or boil over. The heat should remain low and the milk steaming not boiling. As the water content decreases, the volume will start to lessen and the milk will become thicker, creamier, and more concentrated. Once the milk level reaches the 3-cup point which you have previously marked on the side of the pot, it’s done. The finished product is then taken off the heat to be strained. Once the milk is completely cooled, I put it in glass jars. Evaporated milk keeps in the refrigerator for a couple of weeks. Since you have to add other stuff to coffee to make it palatable, why drink the nasty stuff at all? Just pop a caffeine pill into your milk and you’re all set. Because coffee is 50% beverage and 50% experience, Roger. I’m with Leela. It’s a ritual that’s indulgent and pampering as a solo activity – or communal and bonding when shared with a friend. Simple pleasure can be found in the pouring, stirring and tasting alone! How long did it take you, heating and stirring, to reduce the 3 cups to 1.5 cups? At low heat, I’m thinking many hours? Actually, it took me just under two hours. The wider and the more shallow the pot, the shorter the process. Have you ever tried to sweeten the evaporated milk? My husband and I really like our french vanilla creamer. Or would you just add it to the coffee? The only problem with heating the milk this much is denaturing of the protein molecules in the milk. This makes it less “useable” to the body and is treated more like a toxin than food. It would be ok for just coffe, but in large amounts I don’t think it would be healthy. Thanks for the info, Leela! I too was looking for organic evaporated milk, only to reach a dead-end. This is wonderful information Leela! Thank you for posting this article worthy of bookmarking. My plan is to try it out soon as we have a deposit to the food budget and can purchase some organic milk. Thank you again. (1)Homogenizing milk actually does break up the fat molecules and make them less digestable. (2)Using semi-skimmed makes a much lighter drink that is easily absorbed by the body, and it tastes just as rich and sweet; the fat does not stick to your tongue! And it won’t create so much mucus! Thanks so much for posting this. I am going through the same thing food wise (becoming more educated and trying to make better choices. I also came to the same coffee- creamer dead end. Can’t wait to try this! Thanks for the info. I’m trying to make flan in a foreign country where evaporated milk is not available. I was unsure if all this skin I was removing from the top was “normal” and it sounds like it is. Thanks so much for this. I grew up in Barbados and we traditionally take our tea with evaporated milk. Problem is, I use organic milk for everything else — baking, cereal, etc. — but could not find organic evap. Tried to make it today unsuccessfully, when I decided to search. Your info is very useful and I will try it again tomorrow. All the best. Thank you! Not a coffee drinker but my favorite quiche recipe calls for evaporated milk and I have not been able to find an organic variety! Brilliant, thanks so much for this tip. I made some today, and it turned out fabulous. If you have a large nonstick, electric skillet, they make the job go much faster, and easier. I found that you can actually keep the heat up quite a bit higher and reduce your total time considerably. It just requires that you babysit a lot more. Much more stirring and skimming. However, I see no reason why you couldn’t sweeten your evaporated milk to taste if that’s what you desire. There are no rules in the kitchen (well except the laws of physics I suppose). Mike – Thank you so much! Very interesting information. I am one of the lucky since we have our own milk goats. Cream – no problem – we just let our milk sit in the fridge for a day and have all we need. However I am keeping your idea on file in case I ever do want to make evaporated milk from the goats milk. And as a cheese maker I can say heating milk at a high temp does not hurt it. Our pasteurizer heats the milk to 165 degrees and holds it there for a bit of time. Again thanks Leela for the great idea. Thank you for the info. My grandmother is lactose intolerant, I have been looking for lactose free evaporated milk and will use your directions to make it myself. candace – This is not lactose-free. Thanks for putting up this article. I’m developing a new recipe for squash pie and had no evap milk so I just did a batch in a double boiler and had no problems with burning but the skin still needed tending to regularly. Took about 2-1/2 hours but well worth it. It turned out beautifully! I also did the same process with coconut milk and it also works very well. Anon – Thanks for the coconut milk tip. I never knew it could be done. I wonder if this could be done successfully in a siow cooker? Yes, but bring the milk to 180 degrees afterward to kill bacteria; better yet … pressure-can the milk and store in cupboard until needed. Thanks for the instructions! I was about to make butterscotch fudge and had no means of getting hold of canned evaporated milk. The process went surprisingly well, too well in fact!. It took me 20 minutes to reduce 3 cups to 2/3. Perhaps it had something to do with the pot. I used a 9′ cast iron pot and was able to keep the milk at a rolling boil the whole time. Some stuck to the bottom, despite all the stirring, but none of the brown bits came loose. Tip: A metal ruler is very handy when you have to to reduce liquids to a certain point. You just put it in the pot and leave it there for the duration. Anna – Thanks. This is very helpful. Thanks, that’s really helpful. I came across this trying to find organic evaporated milk. I’m developing a business serving organic chai and evap was the missing ingredient. I shall definitely be trying this out! I think I’m going to faint! I’m all about organic and I have to say, this is making me so happy & giddy. I just sent my husband out for a 1/2 gallon. LOL! 1. Can I use skim milk or at least 1% to make this a little less fatty? 2. I understand that it stays completely good in the fridge for a few weeks but, do you think it would be okay to freeze some of it? Hi, I froze store bought evaporated milk as I was going away and it defrosted just fine. Not sure about home made, the few bottles I made got used up quickly so did not have the chance to try but, it is a great idea. Will try the non homogenised milk as well and see what happens. By the way, I eat the cream that collects, I love it, we used to wait for it to form so as to eat it when my mom was warming milk for us! The sticky parts at the bottom are also edible but, a bit odd in flavour. Amazing that no company has come up with it, maybe too expensive as an end product? Anon – Awa, man, I wish I could help you with these questions because they’re good questions. Unfortunately, I haven’t experimented with any of this. If anyone knows, please help. Thanks. Thank you for sharing this recipe! 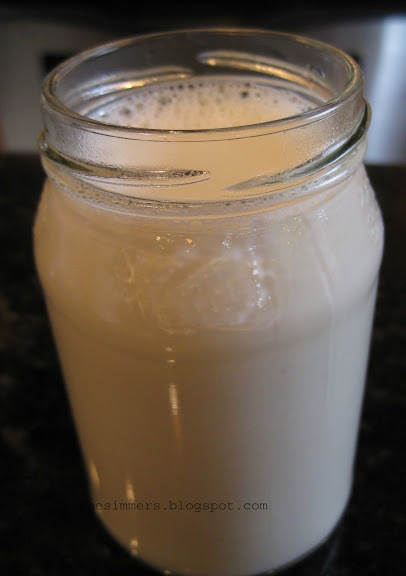 I raise dairy goats and I have been searching for a way to make evaporated goat milk at home. I can’t wait to try it! This is so interesting! I have to try it! I use non-dairy flavored creamer in my coffee and like the taste but feel gross about how artificial it is. Maybe this is what I should be using instead! This worked beautifully! I used it in a homemade condensed cream of mushroom soup recipe. Then I added the soup to the classic green bean casserole as a test run on the hubbs and kids before bringing it to the big family Thanksgiving feast, and he said it was the best green bean casserole he’s ever had! And the kids asked for seconds. Thanks Leela! Someone asked about flavorings, so I’m answering, even though I’m evaporating milk for the first time right now. I’m making this for a pumpkin pie, and the recipe says to put the spices in the milk while it’s cooking down. I’m cooking 5 whole cloves and a handful of peppercorns, a cut-up, fresh vanilla bean, a cinnamon stick, and a 2-inch piece of fresh ginger in 3 cups of milk. I think this will make the texture of the pumpkin filling much smoother, since grated ginger is always a little firm, even after it’s cooked. So if anyone actually likes ‘French vanilla’ creamer, they might want to try adding real vanilla to the milk as they evaporate it. Personally, I would not recommend adding any sugar, since it might burn; I’d just add that to the coffee if you wanted it sweet. I tried this the first time (on top of the stove) and used the milk for my sweet potato pies. The second time I made evaporated milk was in the crockpot. Thanks for the experimentation! I am on my way! If you get something good to read, and are determined, you can stand there the hour and a half and stir and there is no skin. I worry about what is wasted in the “skin” and how much it messes with the proportion I’m trying to achieve. I’ve done this once stirring all the way and once with the skin issue; stirring is better, I think. I put the Gospel of John on audio and followed along on key passages, then my daughter came in and we talked, and that worked, too. I am sure they make auto-stir pots but I don’t know if they make kitchen (as opposed to industrial) size. I, too, have wondered about the crock pot; would it be covered enough to prevent the skin but loose enough to allow evaporation? The problem with crock pots is that you have to be so careful that the clay is truly covered because God only knows what is in that and so many crock pots have tiny holes in the enamel that I don’t trust them. Two things I’ve observed in working with heated milk, usually for homemade yogurt – 1) milk (even lowfat milk) can be heated *without stirring* if placed over very low heat for 2-3 hours. Because the heat has time to dissipate, the milk touching the bottom of the pan doesn’t scorch. I don’t know how the power usage compares to 20 minutes of boiling and stirring; but this might be an option for those with better things to do than stand over the stove. And 2) the “skin” can be tackled by using a whisk to foam up the surface. It has to be refreshed from time to time as the bubbles settle, and it seems not to work as well with cold milk; but I would think that once the milk is warm enough to form a skin it’s warm enough to whisk. I’ve taken to nuking my milk for yogurt purposes (as it doesn’t need to boil anyway) but the second discovery has proved helpful. Thanks. I’m a custom baker and have developed some recipes which use evap milk. But since my other ingredients are organic and local/non-GMO whenever I can source them (I even use butter imported from Europe to try to avoid GMOs which could be in the domestic alfalfa), the milk was a real bugaboo. Your process is a viable option which I shall try very soon. Use a double boiler and there will be no scorching or brown bits. Or, put your milk into your large saucepan; put the saucepan into a larger saucepan of boiling water. I use All-clad that way. A very large crock-pot SET TO WARM is the easiest. BUT: you must can or bring to a near boil afterward to kill bacteria. Organic evaporated milk is available on Amazon.com; very expensive. Denatured milk is better tolerated by lactose-sensitive people. For that matter, organic milk is best all around. We love our local goat dairy! 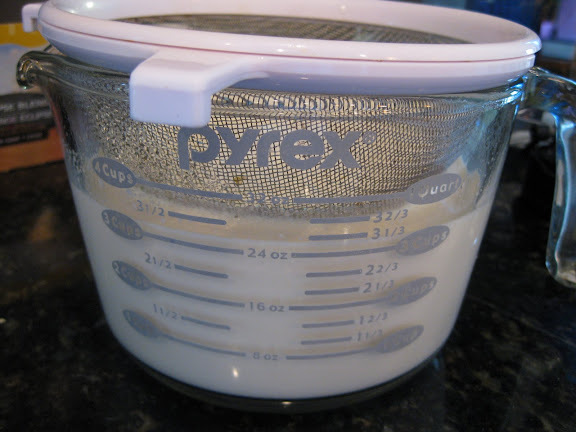 Denatured evaporated milk was a popular ingredient in homemade infant formulas in the fifties. I was the recipient of such a formula; a poor substitute for mother’s milk. I wish they had bought goat’s milk instead. When I make a gallon of yogurt, I heat it to 180 degrees to kill bacteria. 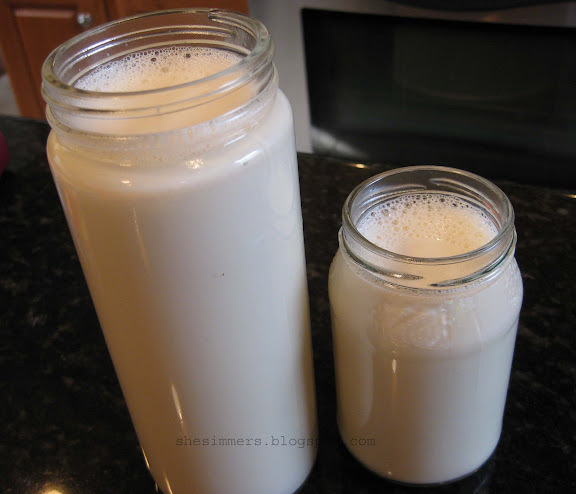 The same for evaporated milk; you want to kill most of the typical bacteria for both evap milk and yogurt. 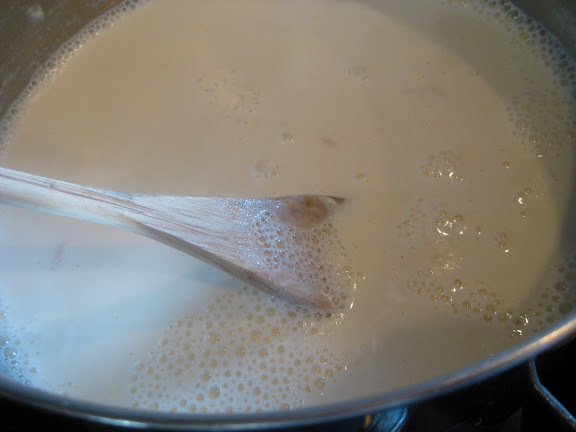 You don’t want the regular milk to grow lots of bacteria when making evaporated milk. AFTER THE EVAPORATION IS TO YOUR LIKING … POUR THE HOT MILK INTO A LARGE BOWL AND COOL IN A SINK OF VERY COLD ICE WATER. Stir with a metal, slotted spoon to help it cool to a good temp before refrigerating. OR: Pressure-can the milk for storing in the cupboard. Use the time and weights you would use for canning fatty meats or fish.